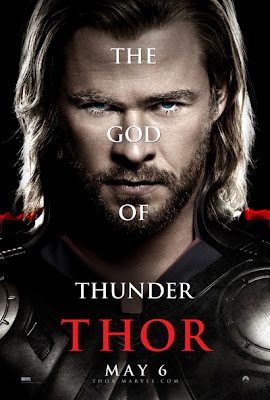 Official Synopsis: The epic adventure "Thor" spans the Marvel Universe from present day Earth to the realm of Asgard. At the center of the story is The Mighty Thor, a powerful but arrogant warrior whose reckless actions reignite an ancient war. Thor is cast down to Earth and forced to live among humans as punishment. Once here, Thor learns what it takes to be a true hero when the most dangerous villain of his world sends the darkest forces of Asgard to invade Earth. This is a movie with a lot to prove. At least it had a lot to prove to me. This was the make-it or break-it film for Marvel to prove that the first spectacular IRON MAN film and the fun, and more than decent, INCREDIBLE HULK were not just flukes after the less than spectacular IRON MAN 2 that seemed burdened down by the shoehorning of elements pointing to THE AVENGERS film (scheduled blockbuster for next summer). THOR is a worthy follow-up and continuation of the new Marvel movie mythology and demonstrates how to integrate those AVENGERS set-up elements without feeling overly tacked on (though there is one notable exception there that I will mention below with a *spoiler*). But let me digress from the film itself for just a moment. Let me say that I make a bit of a game out of trying to get into advance screenings for films. I have gotten pretty experienced at this game and so I knew going in to the summer that THOR was going to be difficult to get in to. I threw my name into no less than 5 different contests to try and win a pass to a screening. As of Monday, May 2, since I had not heard anything I figured this time it was a bust. But I was thrilled to wake up on Tuesday morning to an email notification that I had won passes to THOR for Tuesday night. Talk about pushing it to the last minute. And, of course, it would have to be at the Regal Metropolitan 14 which is all the way on the south end of Austin (and I'm working way north of Austin). The nightmare traffic of glorious Austin, Texas, of course, meant I came very close to not getting in. But I did. 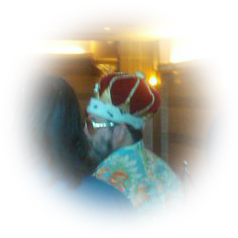 As did this fat, bearded guy in a Hawaiian shirt, sunglasses, and wearing a royal, kingly crown on his head. He showed up without a pass and I overheard that he didn't have a pass, but I did have a second un-used pass so I offered it up to the guy. He seemed very grateful. He also said he spent last night in the drunk tank. He also said Gov. Rick Perry had been in there with him. I think he might be crazy. What made my day was the elderly couple who showed up in line right behind me. Wonderful people. They said they had not been out to a movie in years but that the wife had heard a radio contest for the 8th caller and she called in and they had passes to see this THOR movie. They were all dressed up and thrilled to be there. They said they watched a lady on TV review the movie and she said the movie was one that was "perfect for 13 year-old boys". And the husband smirked and said then it's just about at his level. I also listened to them carry on about the Metropolitan. They didn't even know that theater existed until they won their passes and were amazed to discover there were 14 screens. Very cute and the look they gave each other when they were handed the 3D glasses was priceless. The film started promptly at 7:30 and begins with "Astrophysicist" Jane Foster and her cohorts storm-chasing an atmospheric disturbance that ends up with her running into a big blond guy in the middle of the desert. She wants to know who he is and where he came from. That's when the movie gets started with Anthony Hopkins' narration as the camera takes us to Asgard to learn who Thor is and how he came to be...there in the way of Jane Foster's car. 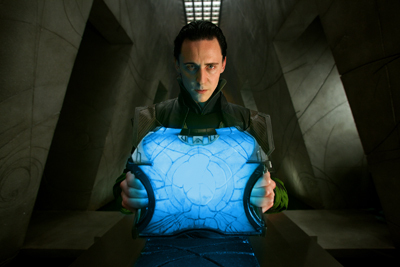 Kenneth Branagh's vision and direction is the key to the success of this film and Tom Hiddleston's performance as Loki is the glue that keeps it from lapsing into silliness. 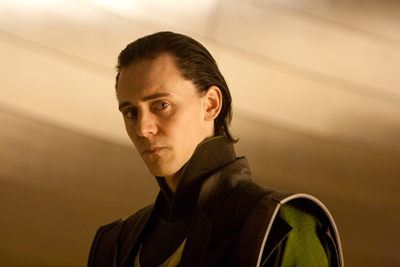 Hiddleston's Loki was far and away the most nuanced and interesting of the characters. Charismatically dangerous and commands the screen everytime he's on, which is not easy with such a physically overwhelming presence like Chris Hemsworth's mighty and bombastic Thor sharing so many scenes with him. A great performance in every aspect. The way Branagh takes the viewer into the other-worldly Asgardian realm is breathtaking. In fact, I can't use the word breathtaking enough to satisfy myself. Truly as close to a metaphoric vision of Heaven as I have ever seen on film. Asgard takes its design cues from Kirby's designs and then runs with them in a way that would surely make the "King" proud. If it weren't a conflict of interest, I'd start the petition right now for Branagh to adapt the NEW GODS to film right now as a follow-up. The scope and breadth of vision, the Kirby-esque armor clothing the characters, the form taken for Bifrost (the rainbow bridge), and especially the thought that went into explaining how the "Nine Realms" form the branches of Yggdrasil, the Worlds Tree, was so well-thought out that I'm almost speechless. Never in my wildest dreams did I expect such a faithful translation of Marvel Comics' version of the Asgardian mythology. 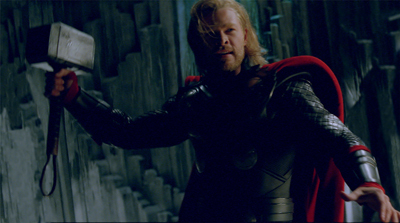 Thor's hammer, the magical "Mjolnir", is especially (and necessarily) perfect. This is not a stupid movie. It is a smart one and deftly put together. The framing of every scene manipulates the drama and moves the story. Branagh's recurring use of mirrors and reflections is put to good use in a number of instances. Structurally, the character arc of Thor in this movie is a condensation of what took years in the comics. 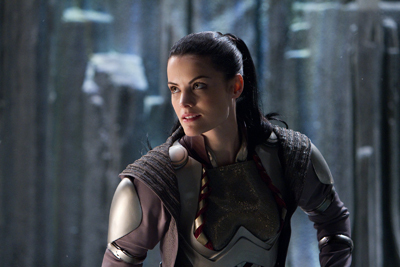 Thor as messianic figure experiences a path of redemption that fully works within the film and fully involves Thor's mates "The Warriors Three" and Sif. 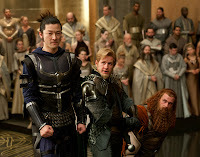 And what a joy it is for a comics fan to see Hogun, Fandral, and Volstagg on the movie screen perfectly visualized and inhabited by their respective actors. I could basically go scene by scene in this movie and pointing out the thrill of seeing something on screen that 20 years ago (heck, even 10) I would have bet good money would never, ever be brought to life on the movie screen. And that's one of the smartest things about this film. The way that they interwove so many aspects of what makes Thor a character that has endured for over 40 years now. It's not just Thor himself, but his world, his loves, his family, and his friends. 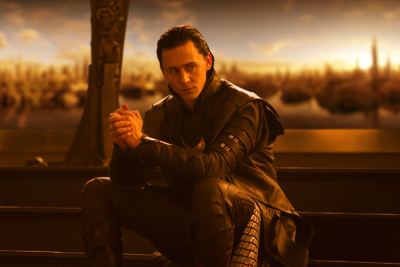 The conflict between he and Loki is so well-done. Thor cannot help but love his brother and believe he sees the good in him. Likewise, Odin is blinded by his love and devotion to his son that he cannot bring himself to believe he is anything other than a good and honorable son. What we see play out on screen is a masterful trinity of conflict. To Loki, Odin appears to favor Thor. However, the viewer sees it quite differently. 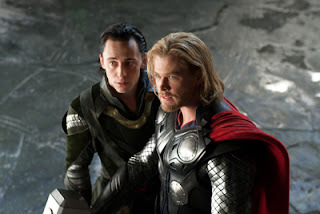 For a reason that unfolds through the story, Odin actually favors Loki with a tenderness and understanding that he does not direct toward Thor. In fact, Odin is torn by conflicting feelings of pride and disappointment directed at Thor that culminates in righteous and justifiable rage at one point. There's lots of action, battles, flying, storm-controlling, a bit of romance, humor that hit everytime. Branagh has a gift for timing and his actors all served him well in that respect. There are so many heroic characters who are willing to sacrifice themselves for love, friendship, and Asgard. 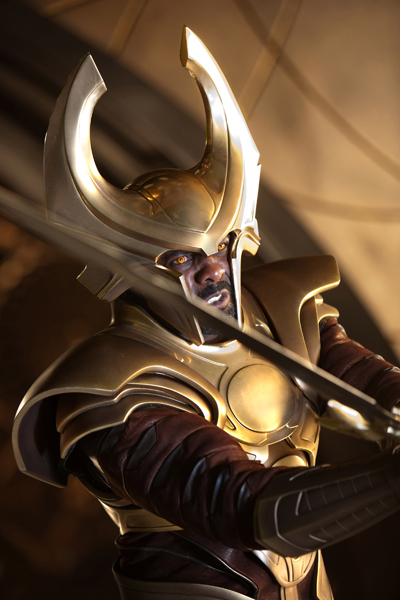 Even Loki, full of malice and duplicitousness, demonstrates heroic aspects. Truly it becomes understandable why the ancient Norsemen worshipped them as gods...although there seems to be a paradox in the ages of the characters synching up with the timeframe in which the Norse would have worshipped them. For example, seems a bit odd to have Thor repeatedly referred to as "just a boy" by Odin and the leader of the Frost Giants, when he would have to be thousands of years old. But we're not supposed to be thinking about that during the movie, right? One of the things about both Marvel and DC Comics and their respective universes is that they have these recurring supernatural/cosmic plot devices that can be used to stimulate story ideas. At DC we have things such as "The Spear of Destiny" and "The Helmet of Fate". 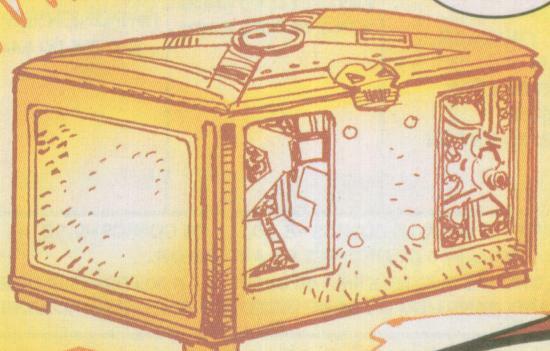 At Marvel we have things like "The Serpent Crown", "The Infinity Gauntlet", "The Cosmic Cube", and "The Casket of Ancient Winters." Two of them make an appearance in this movie and both made this fan's heart leap a bit. As the current comic books seem to be leaving this longtime reader behind, the movies based on the comics are filling that loss and restoring that sense of wonder and thrill that I felt when I was a kid discovering these stories for the first time. Marvel basically exists as film to me now with occasional comic books to supplement, rather than the other way around. When the movie was over, I wanted more. And that, of course, is what every filmmaker wants to hear. On the drive home, I was thinking about what I might like to see in THOR 2 and even THOR 3. If I were running Marvel Studios? I would make THOR 2 about Thor and Hercules getting into a tussle, just like those great old Silver Age comics. Can you just imagine Anthony Hopkins' "Odin" sharing screentime with Brian Blessed as "Jupiter"? Maybe even a plot involving Pluto and Hela romancing and plotting against each other's pantheon. Then followup with THOR 3 and go all out with Ragnarok. It could make for a classic mythological trilogy and they can use the AVENGERS films to do the super-hero thing with the Thor character while they're exploring the mythology in the THOR films. The imagination is running. Thor's helmet and Hawkeye. Thor's helmet only appears on him for 1 scene in the beginning. This makes no logical sense within the structure of the film because all the other Asgardians who wear helmets, including Loki, wear them most of the time if not all of the time. 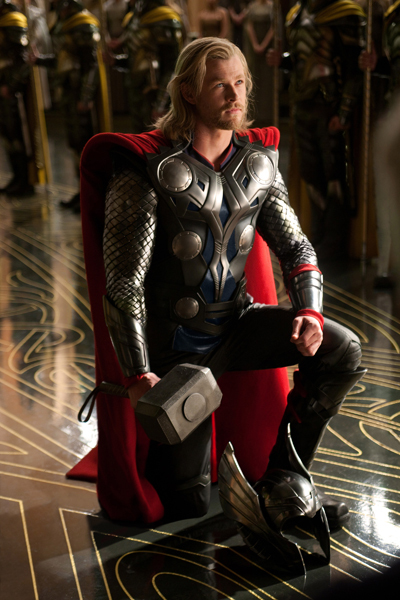 In fact, Thor never even looks like knows or cares where his helmet is. 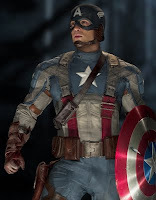 From a longtime comic book fan's perspective, not wearing the helmet would be akin to...oh Green Lantern without his mask or Superman without a cape. 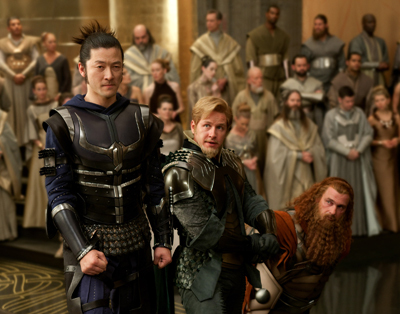 While I appreciated the boldness with which Branagh just embraced the cape and design of the Thor outfit, the appearance of the helmet looked a bit forced into the picture just to avoid people complaining. What is so bothersome about it is...THE HELMET LOOKED GREAT ON HIM! The other spoiler is the appearance of Clint Barton, otherwise known as "Hawkeye". In THE AVENGERS, Hawkeye is a super-hero archer. 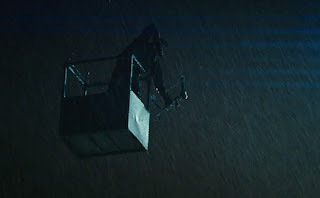 In THOR, he doesn't appear as "Hawkeye" but as S.H.I.E.L.D. agent Barton who takes aim with his bow and arrow on Thor, in human form, as his target. The Hawkeye scene is one in which the human Thor breaks into the S.H.I.E.L.D. camp to attempt to recover Mjolnir. However, this is the one scene in the movie, if you stop for a moment to think about it, that was obviously shoehorned in to tie into THE AVENGERS. Hawkeye never actually interacts with Thor in anyway and his shots are just him all alone perched above and talking to Agent Coulson on a transmitter. It works, but was noticeably shoved in after the fact to me. But the audience cheered when they recognized him. So, this was either an audience with a working knowledge of the comics....or a bunch of Jeremy Renner fans. This was overall a very, very good movie and an exceptionally fun movie. The pacing is great and things are always moving. It really never lets up. Two solid hours of movie fun and I never once looked at my watch. As opposed to, say, IRON MAN 2 where there were a couple of weak performances, this movie hits all its marks in terms of performances and visuals. THOR is an excellent way to kick off the summer blockbuster season and set the stage for what is to come. Just around the corner for Marvel is CAPTAIN AMERICA in July as perfect companion piece for THOR. And when the two of them meet in THE AVENGERS next year, I expect nothing short of greatness.